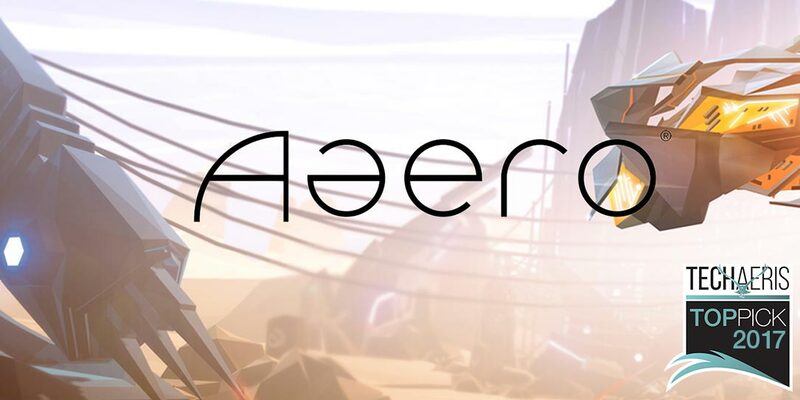 If you’re a fan of EDM and looking for a challenge, Aaero is a great little game for kicking back, turning up the stereo, and enjoying some sick beats as you navigate through the various levels. From rhythm games like Dance Dance Revolution and Rock Band to musical rail shooters like Rez, music combined with video games have definitely been a draw for gamers in the past. Being able to play along to the beat of our favourite songs definitely adds an additional element to our gaming. 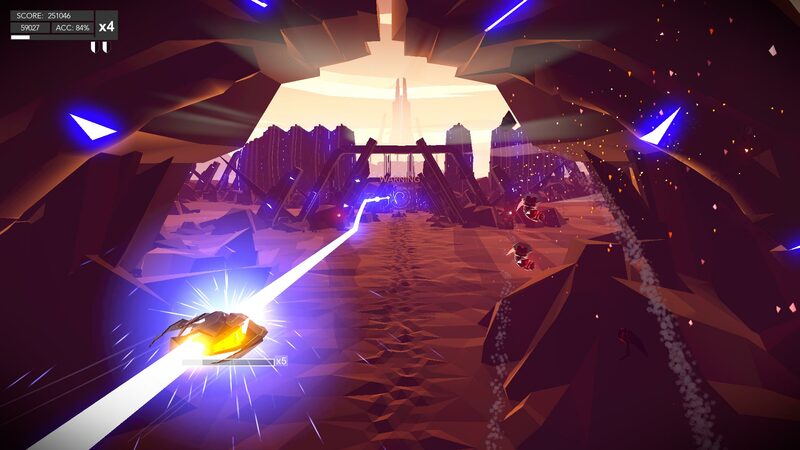 Our Aaero review takes a look at a music game from the two-man studio Mad Fellows which incorporates rail following, shooting, and a pretty sick dubstep/EDM soundtrack. Before we get too far into the review, check out the launch trailer below to get a quick taste of the game. Aaero may seem simple at first glance, and the first level isn’t all that difficult. At the basic level, the game requires you to pilot your ship along light ribbons, dodge obstacles, shoot targets, and destroy enemies including the occasional boss. The trickier part is that this is all synced to a selection of music from EDM superstars including Noisia, Flux Pavilion, Katy B, and more. Each of the light ribbons twists and turns in sync with the beat. The more accurate you are following the light ribbons (and the controller vibrates when you are accurately following one), the faster your score multiplier increases to a maximum of eight. When you’re not following the light ribbons, your multiplier actively goes down so you’re going to want to be as accurate as possible. When shooting enemies you have better luck if you time your firing with the beat as well. A successful launch of your shots will result in straight lines towards your target, while an ill-timed launch will result in curved lines which will take longer to reach the target. Overall there are 15 levels, which doesn’t seem like many but don’t expect to rush through them quickly as they become pretty challenging rather quickly. 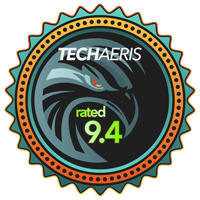 At the end of each level, you are awarded up to five stars based on your score and accuracy. Subsequent levels are unlocked based on the current total number of stars you’ve collected in previous levels. 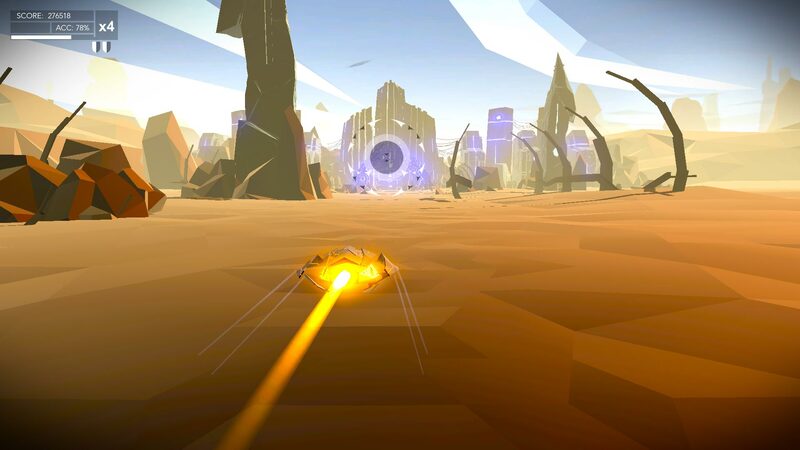 There are four available game modes in Aaero: Normal, Advanced, Master, and Chill-out. If you’re having difficulty passing a level, simply head into Chill-out mode where you have unlimited lives so you can practice each level until you nail the difficult parts. As for the other levels, as is typical in most games Advanced is more difficult than Normal, and Master is for those who are after a really serious challenge. In order to unlock Advanced mode, you need 90% star completion in Normal. To unlock Master, you need 100% completion in Normal and Advanced. As far as game controls go, Aaero is pretty easy to play and uses a controller, even on the Steam version. We had a chance to check out the PC beta before launch and there were next to no differences in gameplay that we noticed between that and the Xbox One version. When using an Xbox One controller, the left thumbstick controls your movement and is used to follow the light ribbons. The right thumbstick allows you to aim and target up to eight different enemies — or eight successive shots on a boss. Once you have your desired targets selected, pulling the right trigger unleashes a volley of shots. You’ll have to be quick though as enemies will release a series of bombs that will come your way if you don’t destroy them first. The two main ways you’ll die is from these bombs or crashing into obstacles, and you only get three lives per level before you’ll have to start over again. The game features single player only but does include online leaderboards so you can compare your scores with friends and other players from around the world. As far as graphics go, Aaero has a dated techno/cyberpunk look but it works very well with the soundtrack and gameplay mechanics. The levels are generally a combination of interior tubes and outside desert sands with strange objects protruding from the ground. While they’re not anything to write home about, the darker purples and reds of the interior areas combined with the sand coloured outside areas mix well together, and as mentioned work well with the songs for each level. As mentioned in the gameplay section, the premise of the game relies heavily on the included soundtrack. 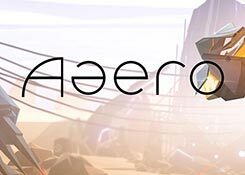 Aaero features licensed music from the superstars of the EDM genre including Noisia, Flux Pavilion, Katy B, Neosignal, Astronaut, Barely Alive, and much more. The levels were very well created to match the chosen tracklist and I didn’t initially notice it but there are no additional sound effects and the game relies solely on the accompanying soundtrack. It’s an interesting idea and it works very well. As you can see, there are some pretty decent artists on the list and if you want to check the tracks out (with the exception of “Ill Still”), you can check out our Spotify playlist. With a price of only $14.99USD Aaero is definitely worth it for the challenging gameplay and soundtrack alone. To commemorate the launch of the game, Aaero is currently available for the limited promotional price of $11.99 USD, a 20% discount which makes it a no-brainer to pick up. Interestingly enough, the game is $14.99CAD for Xbox One and $19.99CAD on PlayStation 4, so if you have both systems you might want to pick up the Xbox One version. 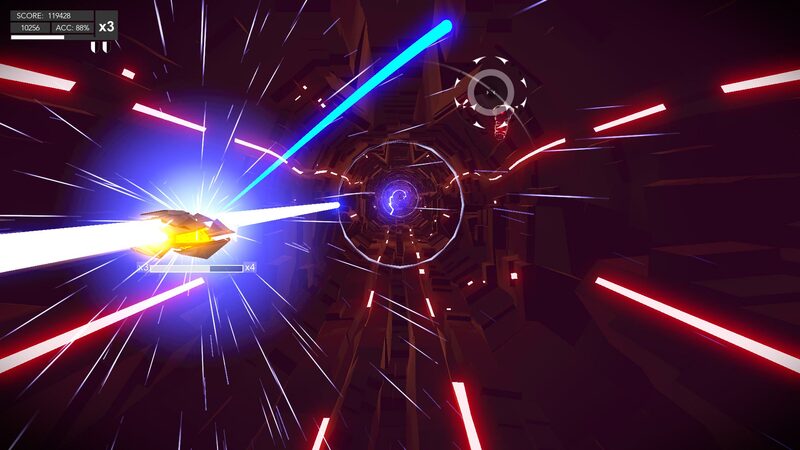 If you’re a fan of EDM and looking for a challenge, Aaero is a great little game for kicking back, turning up the stereo, and enjoying some sick beats as you navigate through the various levels. As challenging as it is, it can also be very relaxing. The two-man studio Mad Fellows definitely has a hit on their hands here and as such, Aaero is a no-brainer for a Top Pick of 2017 Award here at Techaeris. *We were sent a copy of Aaero on the Xbox One for the purposes of this review. Did I mention great EDM tracks?